If I convinced you that everyone should make yogurt, here's how to do it in ten easy steps (and with no special equipment). 1. 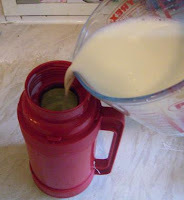 Fill a thermos flask with milk (you can choose any kind of milk - skimmed milk, full cream, goats milk - anything at all), then pour it into a microwave-safe container or a pan. 2. Bring the milk to the boil. I used a microwave, but you could heat it on a stove if you prefer. Just watch that it doesn't boil over. This step is to kill off any unwanted microbes that will cause the milk to spoil. 3. 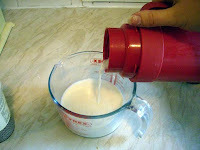 Allow the milk to cool to around 50°C (122°F). I've got a new whizzy electronic thermometer so I used that, but you could use any kind of thermometer, or you could stick your clean finger in it. 50°C isn't hot enough to burn you, but it's too hot to comfortably keep your finger in for long. This is the optimum temperature for the yogurt culture beasts to grow. 4. Add some live yogurt to the milk. You can use a little of your last batch, or you can buy some fresh yogurt to start your culture off. This contains some of the yogurt culture microbes that are going to multiply and turn the milk to yogurt. You don't need much. I usually use about a dessertspoon, but in extremis I have swilled the milk in an empty yogurt pot to rinse off the bits of yogurt clinging to the sides, and it worked fine. 5. Pour the proto-yogurt into the thermos flask. Fill it to the top. It won't change in volume at all. Now seal the flask and leave it somewhere it can be undisturbed for 8-14 hours. Overnight will be fine. 6. After 8-14 hours with any luck your flask will be full of yogurt. When you take the lid off, you'll think it has failed, because it has not changed in appearance at all. It gets me every time. But when you try to pour it out, you'll find it is no longer thin and liquid, but has thickened considerably*. But the chances are good that if you followed my instructions, you have made yogurt. Well done! 7. You can put your yogurt in another container and put it in the fridge (warm yogurt is kind of yuk) and eat it just as it is. But if you want to make Greek (strained) yogurt, there is another step to the process. 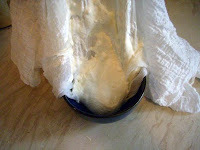 Pour your yogurt into a muslin cloth, and suspend it over a bowl for two hours (I put the cloth in a colander over a bowl). 8. After two hours the colourless liquid whey will have strained into the bowl and the remaining yogurt will be thickened and creamier. You couldn't pour it now. You'll have to scrape it off the muslin cloth. 9. Congratulations, you've made Greek yogurt. It's deliciously thick and creamy, even when made with skimmed milk. It's more stable in cooking than normal yogurt (but did you know that if your yogurt separates when cooking, you can stir in a spoonful of cornflour and stabilise it?). I like it on its own with honey. It also makes wonderful raita. 10. If you leave it straining for longer than 2 hours it becomes thicker and thicker and eventually will have a consistency like cream cheese. Stir in garlic and herbs if you like, and use it like Philadelphia. Delicious. If the milk was too hot when you added the culture, all the beasts will have been killed. Warm it up to 50°C (122°F), add more culture and try again. If the starter was old, it may not have had any live beasts in it to begin with and the milk will still be runny. You'll need to get a fresh starter from the shops. It's up to you what you do with the warm milk. I suggest cocoa. If the milk was old it may have curdled. Pour it away, it's ruined. If the equipment wasn't clean, some spoilage microbes may have got in and spoiled the yogurt. Pour it away, it's ruined. If you didn't leave it long enough, it won't have had time to set (sometimes it seems sort of slimy but not really thick). Make sure it's still warm enough and leave it a bit longer. If you left it too long, it may have separated into yellow whey and white curds. It's fine. You can stir it back together, or use it as it is to make Greek yogurt. Well that's another project for the weekend then! I've been meaning to make it for months, but with my crazy little materialistic mind I keep thinking I should buy a flask made for making yoghurt. Silly me. I shall dig out my old flask I used to take down the allotment with me post haste. Great, the more people who know about home made yog the better, it's so easy. I'm sure you know that the liquid you strain off can be used for making pancakes and scones, and your starter culture can be frozen too in useable amounts. I'm enjoying your blog, I'm a newcomer to this business but I'm getting inspired to do my own too! Thanks for these instructions, I LOVE greek yoghurt and spend a fortune on it at the shops. Can't wait to try this. And the beauty is you can just save a table spoonful to start off the next batch too! Ooh, I've got a week off coming up, and that sounds like a nice little project. On a side note, how environmentally friendly are microwaves? Is it better to bring milk to the boil using a microwave powered by electricity that's generated (mostly) from burning gas, or just burn the gas yourself on a hob? How much milk is needed to make 1kg of thick yoghurt? Anonymous: I'm guessing about a kilogram of milk - or rather a litre of milk will turn into a litre of yogurt, since the bacteria themselves don't really weigh anything significant! A kilo of milk will make a kilo of just-plain-yogurt, but if you strain it you will end up with less than a kilo of Greek yogurt. Exactly how much whey you lose depends on exactly how long you strain it, but I'd guess it's perhaps 25% or less of the original volume, they way I do it. So if you start with 1.33 litres of milk you'll end up with roughly a kilo of Greek yogurt, YMMV etc. But I usually make a thermos-full, because thermoses are most efficient when they're full. About microwaves - It takes less energy to boil a pint of water in a microwave than to boil it on a stove*, so from that point of view a microwave can be a more energy-efficient way to cook than the stove. My stove is electric not gass, so whichever appliance I use to boil my milk, the fuel is electricity. And I get my electricity from a supplier than uses 100% renewable energy sources, so no gas is being burned. I don't use my microwave much, and not usually for cooking per se. I use it to warm up cold cups of coffee and tea for me, to keep Ed's dinner warm if he's home late (it has a keep warm setting and I'm sure it's more efficient than keeping the whole oven on low), for defrosting some frozen foods, melting butter and almost always for boiling milk, because milk often burns at the bottom of the pan, which makes the milk taste bad and is a nightmare to clean. I hope you all enjoy your yogurt-making experiments! *some very well-defined physics tell us exactly how much energy it takes to boil a pint of water. You may have studied specific heat capacities and latent heat of boiling at O'level. But the efficiency of the different appliances varies. As well as the water, my stove has to heat up my cast-iron pan, and also heats the air and the surface of the stove. My microwave only has to heat a glass or plastic jug, which has a lower thermal capacity than cast iron, and the microwave itself remains cool to the touch, inside and out. 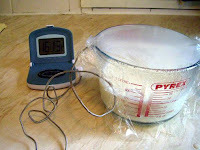 Benjymous - I'm still resisting a microwave 30 yrs into my cooking life. Actually, I don't resist them, I don't even think about them. What I do want, though, is one of those cone-shaped sieve things. But today is the first day I ever wanted one, so I will probably forget about it soon, and want one again 20 years from now. 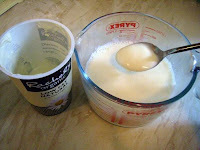 Yoghurt - I make it in quart/liter used yog. containers, and incubate it in a big pot of hot water in the oven overnight. That way I don't have to transfer it after making. Sometimes I mix in dry milk powder if I think it's too thin, but I like the idea of straining it better - will try it next time. I just found you, Ms Sprouts, yesterday. I like your ideas a lot. Non-judgemental, inventive, and fun. Thanks for everything. Great tutorial. One of these days. . . I ended up making some, turned out great! Thanks for this recipe, it never would have occurred to me to make it otherwise. My husband has been making me yogurt, and smoothies from it, for years. During my year of cancer treatment, there were times it was all I could manage. I have a recent problem, though, and hoping someone can help. 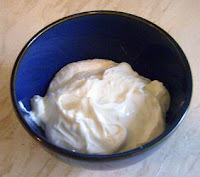 I recently had some Greek yogurt from a store, and he tried to make a batch of homemade using the Fage. Everything else was the same, but it didn't "yog," as we say. Any suggestions ? I also wonder if there's a strict definition of Greek yogurt. I've read that they strain out the whey, but I've done that with my yogurt, and it doesn't have the same mouth-feel. Unfortunately, there seems to be a lack of info on the labels, so I'm left wondering about things like "what animal did this milk come from - cow, sheep, goat ?" Just made my first batch of yogurt in over thirty years and it came out great. I used "Yogourmet" starter and a half gallon of whole milk. Heated the milk to 200 f (sorry for the non-metric units!) then cooled to 110, by imersing the pot in a bowl of cold water, and added the starter. To incubate, I filled a big spaghtetti pot half full with water, boiled it and put it in the oven. That rasied the temp in the oven to 112. put the milk with starter into two one-quart jars, and put in oven. 4 hours later the temp was down to 108 and the yog was perfect! it's straining now through coffee filters layered in a colander in the fridge. Thank you so much for this! Greek yoghurt is so expensive to buy and this is a great and better alternative. Thanks for sharing. I miss Greek yoghurt as they are not sold in my home country. I live on them when I was in Brisbane for three years and I am glad that I can try to make some on my own. I would like to know how long does the greek yoghurt last? Does it have to be eaten within a few days? And is the straining part done in room temperature or do I have to leave it to strain in the fridge? Has anyone ever attempeted to make greek yogurt with kifer? Wow this is so easy,works everytime(so far),Even after forgetting to save a spoonfull for next batch and using what was left around the bowl. Can't wait to try this, especially with the helpful tips of using the microwave and a strainer. All I need is cheesecloth! I am a minimalist with a small kitchen, and I was actually contemplating buying a yogurt machine. Not now. And I can make cheese too! Wonderful blog, I subscribed. Thanks for posting these topics. @xernieve - I ate a tub of unopened shop-bought live greek yoghurt last month (April) that was from December, and it (and I) was fine. Yesterday (May), same story - sealed, shop-bought live yoghurt (with fruit, too) from Feb, and this one not refrigerated the whole time. It was fine, too. (The strawberries had gone a bit brownish from reddish, that's all). If it is the "pure" yoghurt, or has only had sugar / honey added, then it'll keep longer than if you've added fruit. (If you boil the yoghurt to kill off the live culture, it won't keep as long). I just came across your post and cannot wait to try it. Gone the complicated yogurt makeer that I used years ago. YAY! Thanks for these step by step instructions! It's hard to find good Greek yogurt here to make tzatsiki, so I will be sure to try this method! i have my boyfriend's mother's big batch yogurt maker, still works fine. A shout out to my UK frugal, sustainable living peeps! cups of milk in a pyrex measuring cup into the microwave and set the timer for 5 minutes and walk away. Come back in around a half hour and scoop in a spoon of yogurt from my last batch, close the door and walk away. Open it up again the next morning and it is yogurt. Maybe an over-simplified approach but it takes me less time then fixing up a bowl of cereal. If you use pasteurised milk, do you even need to bring the milk to boiling point? Could this step be missed and just heat to 50 degrees cent.? (though following all your steps works great as is!). Zygote - the best way to find out is to try it. My guess would be that it would work sometimes and sometimes it would fail, because even pasteurised milk is not sterile so sometimes the other bugs in the milk would compete with the yogurt bugs and prevent proper yogging. But whatever you do, don't take my word for it. Find out for yourself! You could try it with sterilised milk. I don't buy sterilised milk because I don't like the flavour. I'm not even sure you can get it any more. I haven't seen it for years. Yes - that's my gut feel too. Trying is fine but why risk failure when your way works! Just wondered if you (or anyone else) had tried! "Trying is fine but why risk failure..." why, for the knowledge of course! All you risk is a pint of milk and a little of your time, but you gain knowledge. That's what "self-sufficiency" is all about. We've made yoghurt for the first time. Over tea we sat watching the hot milk cool and then added the spoonful of yoghurt and left the thermos flask on the table. At breakfast we opened it and we have yoghurt. Now it's being strained in a cat free room whilst we go to church. Thanks again for all the ideas Mel. Laura and Amy and I will be almost skipping to church with the excitement. The result of our yogurt making (and butter as well) was homemade scones with freshly made strawberry jam (still hot) and really thick yogurt. Yum. I saved some of the whey (after straining the yogurt earlier) to thin back out glassfuls of yogurt for the girls. Into the glasses of yogurt I stirred warm strawberry jam. Happiness at teatime! Thanks, Melanie, for inspiring first my girlfriend and then me to make yogurt. We blogged about it also in our food issues blog. I'm looking forward to many variations of this wonderful food. Using the microwave method is there some point in which you need to cover the measuring cup? groovyd: how many cups do you use in your microwave method? Must be quite a lot as it would boil over if left heating for 5 minutes. I can't tell you how much I am loving that I can make my own yogurt, easily, quickly and organically. I use organic milk instead of regular. Even today, the yogurt costs half as much as organic store-bought yogurt and it is fresh and completely free of additives. I don't worry about it going bad - I go through alot making smoothies for my bunch. Can this be done with soy milk? Goat's milk? Thanks! Thanks for the directions! I've made 3 batches so far and am planning a 4th batch today. I used Fage & Stonybrook as starter - but I didn't like the taste of that. I prefered using only Fage as a starter. I stirred in some sugar free preserves before eating to make a fruity sugar free yogurt. when they all left home. I never knew how to make Greek yogurt so I'v already made my first batch and it's yummy. I'm about to pass on your method to two friends, one of them in Argentina. So thanks again, love your Blog, I'll be keeping an eye on it from now on. Thanks for this blog. I make my yogurt the same way but instead of putting it in a thermos, I set the jars on the window sill and wrap a towel around them. My question is why my yogurt doesn't congeal in the winter months. Does it all depend on how fresh the milk and yogurt is in the first place. During the summer months here in sunny Israel, my yogurt would be perfect and thick. Now it has the consistency of buttermilk and is more runny. Melanie, I just made a new batch of yogurt using my freshest yogurt as a starter. I'm crossing my fingers and hoping that this batch will be a success! Do you think that by placing the jars in a warm oven during the winter nights will hasten the congealing process? Hi Alisa. Temperature is important for the beasties to grow and multiply. My technique uses a thermometer to achieve the perfect temperature, and a thermos to maintain the temperature. This gives you a better chance of success. Using other methods such as sunny windowsills and warm ovens are a bit more hit-and-miss - you'll succeed sometimes and fail other times. Melanie, I have good news! Thanks to your patience in explaining to us the importance of temperature consistency, my yogurt came out well! But instead of a thermus, I put my 2 half liter jars in a warm oven and by the next morning, my yogurt was congealed and ready to refrigerate. Melanie, I have good news. Thanks to your patience in explaining to us the importance of temperature consistency, my yogurt came out well! Instead of putting the mixture in a thermus, I put my 2 half liter jar in a warm oven. By morning, the yogurt was ready for refrigeration. I am currently living in South Africa and used a store bought bulgarian yoghurt for the culture. It has stabilisers and potassium sorbate preservative, would that be the cause of the batch failing to congeal? After 14 hours it is slimy and sticky and I am determined to get this right as the yoghurt here is certainly not the same as I have experienced in Europe. I've had fresh yogurt on a mountain dairy farm in Greece 25 years ago, unforgettable. I'm glad I have a recipe now. it's equally easy to make and requires straining as well. I use one of those 1 quart yogurt makers: Pour in a quart of buttermilk (after cleaning everything with boiling water), leave it for 16 hours, then strain for two hours. For straining I prefer a Donvier Jogurt cheese maker. It's basically a wedge shaped metal sieve in its own square container with a plastic lid. Done! 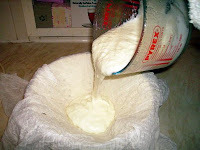 (Straining yogurt in it will produce a cream cheese alternative within hours). Also, I use the whey (which amounts to 50% of volume!) for baking. Next time I come across a wide mouth thermos at Goodwill I'll try making Quark that way. I googled the phrase "how to make Greek yogurt" and your post came up. Thank you SO MUCH for posting this I am so glad I found it! My mom used to make yogurt when I was a kid but I had yet to successfully make a batch myself. First batch went into the thermos last night and turned out GREAT! It is now straining. I love yogurt and have been frustrated literally for years at the ingredients of yogurt on supermarket shelves. So, thanks again! I'm so glad you have such a easy way to make greek yogurt! I love it and its so expensive. I used your instructions and I'm waiting to see how it turns out. I'm certainly going to link to your site when I post about it on my blog! Thanks so much! I noticed at the market that several brands of yogurts boast several different 'beneficial' cultures in the cup. If I use a spoonful of this yogurt will all the bacteria noted on the cup multpily? Hey Bean Sprouts! Glad to have re-discovered your blog again, as jam packed with info as I remembered it. Pity about the spam you've got, how annoying! Anyhow, today is my first attempt at making Greek Yogurt. I don't eat it, but I thought it might cheer my mother up as she's under the weather today. I got here from Fake Plastic Fish. I'm trying to use less plastic and encouraging my parents to do the same, thing is, my mother used to make yogurt all the time. Perhaps this will rekindle her memories! Part of this problem I think lies in the perceived monetary value of digital data, i.e. none. Because video games have for so long relied on tangible media carriers, from cartridges to cassette tapes to discs, they have taken their place in society as a commodity, a tangible product. However, what makes the game is, to put it stupidly, a series of 0s and 1s that can be transferred easily on a media carrier of your choice and propagated without loss of quality. assigned value to the data on it, namely all his material, all the things he had written. But somehow this is difficult to do. As a society we still see digital data as intrinsically without value. It's just there, you can't touch it, you can't see it, it is worthless. It would be more like going to the shop with audio recording equipment and recording the music they are playing through the store's PA system to be enjoyed at home at a later date. This lack of a sense of value is not the reason people pirate software but it's the facilitator that makes it easy to justify to themselves. And as society becomes more and more plugged in, even if that is wireless, this is an issue that will need to be addressed. Data has a monetary value. People need to change their thinking to incorporate this philosophy. but with my crazy little materialistic mind I keep thinking I should buy a flask made for making yoghurt. Silly me. I shall dig out my old flask I used to take down the allotment with me post haste. Going back to the heating of milk in the microwave for yogurt making. I recently spoke to a healthy eating fanatic who said she wouldnt entertain cooking anything in a microwave. She said try growing seeds from cooled water that has been heated in a microwave. If this is the case, could it be possible the yogurt sets, but the desirable cultures are unable to reproduce, so you have normal yogurt and not pro-biotic? any ideas, does anyone have a testing kit?????. Mildew, you really don't need a week off to do this. After I've brought my milk to a simmer, I wait about 20 minutes. I always try to rush this, so I find it's best to take my dog out for a pee-break/mini-walk, or just watch an episode of 30 Rock (each about 20 minutes long without commercials). That's just about the right amount of time to bring it to the right temperature for adding the starter-yogurt. In summer, I transfer it to my thermos and leave it on the counter overnight, but in winter, I pour it into a glass jar (canning jar, old jar from commercial spaghetti sauce or jam, etc). Then I slip the jar into a wooly sock whose mate has been long since lost, and whose primary function is now Yogurt Sock, and I take it to bed with me. It keeps me warm overnight while I keep it warm. This method might not be for everyone, but I get a kick out of feeling like a mother hen incubating her eggs... her delicious yogurt eggs that she's going to eat soon... Also, don't try this if you're a fussy sleeper, because the cultures need to be kept still to work their magic. In the morning, you'll have to give it a good shake to mix the whey back into the yogurt. I rarely strain mine unless I'm making yogurt cheese, because I like the tangy taste. The odd time it's ended up too thin, I just add a little honey and use it as a delicious dessert drink. Thanks for this post! I've never tried microwaving my milk, and since it uses less electricity than my range, I'll give that a shot tonight. Great blog!